Welcome to my holiday apartment, “Ferienwohnung Ruppenthal”, 45 sqm. 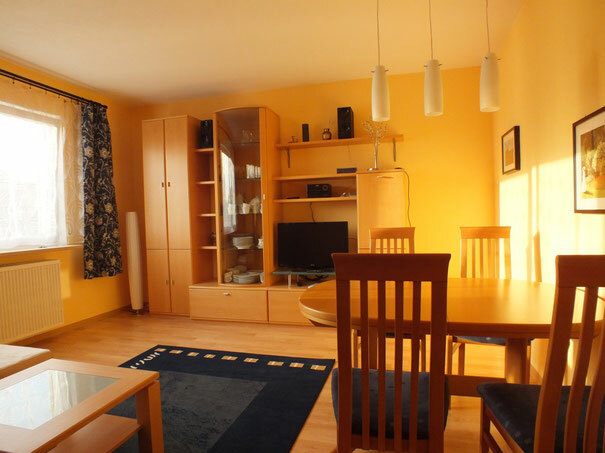 The apartment house is close to the thermal bath “Vita Classica” and to the hospitals Rheintalklinik, Breisgauklinik and Herzzentrum Bad Krozingen. We are in the border triangle between Black Forest, Vosges und the Swiss Jura Mountains. No matter if you come for vacation or rehab – here you will find peace and recreation and even fitness and wellness programs. The Romans discovered the mineral springs and their beneficial effect on heart, circulation and joints. Today this town is a well-known wellness - center with recognized doctors and hospitals, very close to the apartment freiburg, such as the the Rheintalklinik, Breisgauklinik, Schwarzwaldklinik and Herzzentrum Bad Krozingen. They offer measures for rehabilitation, reha massnahme. Black Forest, Kaiserstuhl, Vosges and Markgräfler Land offer an excellent net of hiking or cycling tours. Enjoy awarded wines and delicious meals in a restaurant or visit cozy mountain huts or wine taverns in the vineyards (Straussenwirtschaften). Bad Krozingen is 230 metres above sea level and the distance to Freiburg is about 15 km, to Alsace 15 km and to Basle 50 km. If you have any questions, please contact me. I could give you many tips for hiking tours and places where you can do well being. I wish you a pleasant stay in my holiday apartment, close to the Kurpark. In Bad Krozingen, in the heart of Breisgau, Markgraeflerland, you can start your vacation, for example recovering in the mineral-thermal bath Vita Classica, near by my apartment Bad Krozingen. Welcome to well-being, wellness .